This is the time of the year you can find fish gorging themselves with food getting ready for the winter months ahead. If you can find a creek with shad in it, you can probably catch bass there. The key is to use your electronics to find schools of shad or watch for them “flipping around” on the surface. For sandbass and hybrids, watch for the birds feeding over open water. If you see birds diving down to the water for shad, chances are good that there are fish beneath them. I have been catching largemouths on jigs, crankbaits and soft plastics. Near the edges of the creek channels, I have caught 4-6lb. fish on white, 3/8 oz. Bulldog jigs with a Kalin’s hand-poured frog trailer. These trailers, which have salt and crawfish scent built in, have proven to make a big difference for me. The scent literally “oozes” out of them while you fish, making them irresistible to the fish. White and other shad colored Deep Little N’s and DD14 crankbaits, by Norman Lures, are catching fish holding out between the shoreline and the edges of the creeks. I have found that varying the speed of the retrieve from fast to slow will often trigger a bite. 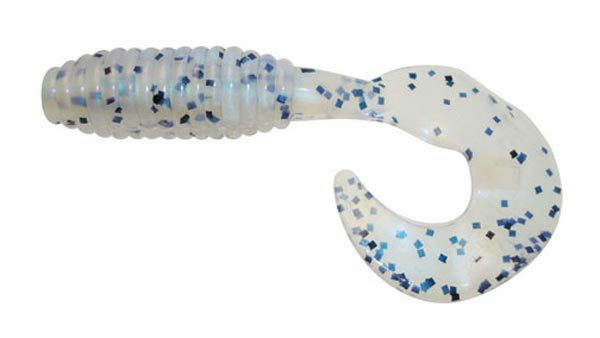 I pitch a 5″ shad colored Salty Lunker Grub rigged with a 3/0 hook and a 3/16-oz weight. The lighter weight allows the grub to fall slowly beside a lay down or in a cedar tree, resulting a strike. The fish are usually suspended this time of the year. The injected salt found in the Kalin grubs, like the jig trailer, seems to make a difference in the number of strikes I have been getting. The sandbass and hybrids that are found schooling under the birds can be caught on topwaters and Rattletraps. The best colors seem to be chrome and chrome with a black back. The ½ oz. Rattletrap is good for catching sandbass while the ¾ oz. bait has worked well for the larger hybrids. If it is a cloudy day, gold Rattletraps should work if the chrome ones don’t produce. Whether you are going after largemouths or sandies, the cooler temperatures make the experience more enjoyable than an outing a couple of months ago when temperatures were in the 100 degree range. Fall is my favorite time of the year. The fish bite better and hunting season is upon us. What a great time to go out and enjoy the Texas outdoors.